At last for BFD2, we are delighted to announce multitrack samples from master drummer, Terry Bozzio, known for his astonishing work with Frank Zappa, UK and Missing Persons recorded by legendary producer / engineer, Ken Scott. 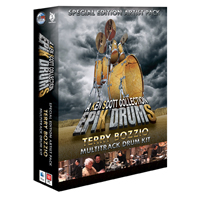 In the EpiK DrumS series, Ken recreated the drum sounds of multitrack studio sessions he recorded with Terry. The most authentic classic drums were achieved from using the same rare recording equipment, the same instruments, advanced sound development by Sonic Reality and collaboration with the original drummer, Terry Bozzio. All together this makes up one of the most EPIK productions ever for a software drum instrument. The session with Terry Bozzio went really smooth. We did it just outside of LA where both Terry Bozzio and Ken Scott live. It was at a place called "Emblem Studios" which used to be called "American" and they had the all important Trident A-Range console that Ken needed to recreate these Epik sessions. Terry even still had his original drum kit that he used with Missing Persons as well as Zappa and UK. It was mostly a kit made up of Roto toms and unusual inventive cymbal stacks. A really unusual sounding kit that s great for prog to punk!